We are almost at the end of this calendar year. The countdown for 2017 has already been started. I am sure that you must be preparing the list of plans for the New Year or New Year's resolutions. I have some plans for the New Year but, to be honest, I’ve never been too bothered to make New Year’s resolutions. However, from the upcoming New Year, I would like to write and share my experience of motherhood. I mean to say that I would like to introduce a new segment on my blog or start a separate blog (yet to be decided) for baby stuff, mom stuff and I don't know what else. So far that's my plan. Now coming to the point, today I am going to review Assure Moisture Rich Shampoo which is enriched with Green Tea Extract. 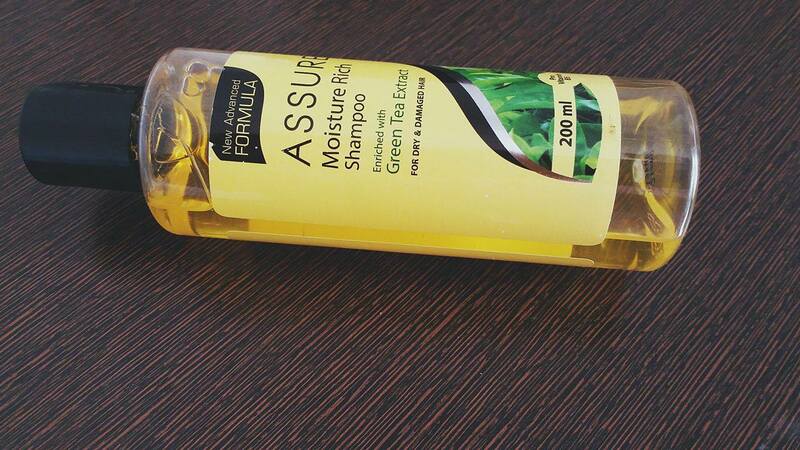 This shampoo is used for dry and damaged hair. 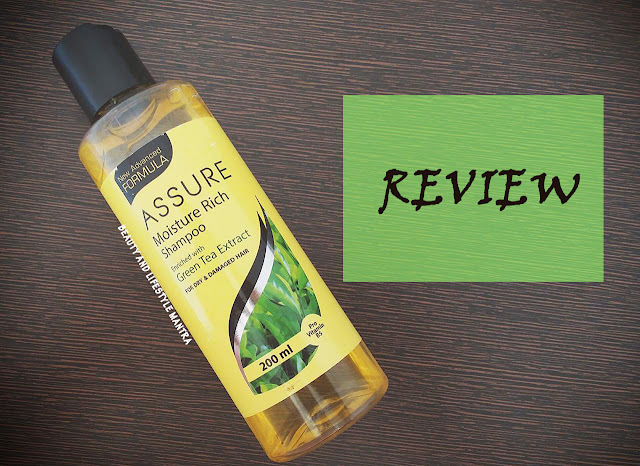 New Assure Moisture Shampoo specially formulated for dry and damaged hair gently cleanses the hair making it manageable and smooth. Enriched with milk protein that hydrates dry hair and makes them soft & shiny.Green tea extract nourishes the hair and strengthens it from the root to tip. Apply to wet hair and scalp. Massage gently and rinse thoroughly with water. Repeat if necessary. For best result follow with Assure Fortifying Conditioner. 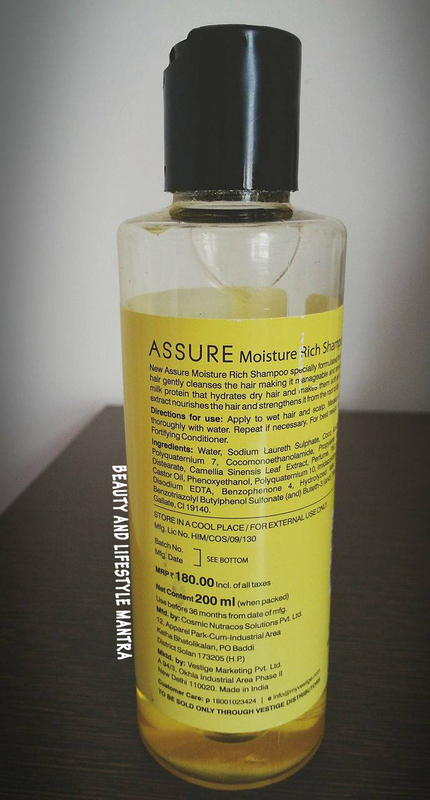 Assure Moisture Rich Shampoo comes in a transparent sturdy plastic bottle with a screw cap that further comes with press button opening. The shampoo very easily dispatches through the press button opening. The packaging is very simple and I have used 200 ml bottle which was quite perfect for carrying while traveling. I’ve taken this with me while traveling and it has never leaked. However, I suggest you, if you are carrying shampoo in your bag, make sure that you take the shampoo bottle in a separate plastic bag or tape the cap tightly to prevent any chances of leakage. It has a bit runny consistency and looks yellow in color. It smells refreshing and nice, which is soothing and not at all overpowering. After shampoo, the smell does not last long on my hair. The shampoo contains Green Tea Extract, Milk Protein, and pro-vitamin B5. Green tea is a good source of polyphenols, Vitamin C and Vitamin E that are helpful in stimulating hair growth and softening one’s hair. Whereas pro-vitamin B5 is an essential vitamin for hair growth. Milk Protein hydrates dry hair and makes them soft and shiny So, these three essential components making this shampoo very promising. My primary purpose in buying this was to reduce hair fall and provide shine and softness to my hair. Overall, it could manage my dry frizzy hair according to product claims. Assure products are sold by Vestige distributors. One of their distributors suggests me this shampoo. It had a good lather and rinsed out easily with no residue. But if you oiled your hair then you need a very good amount of shampoo to wash. After hair wash, I didn't notice any extra hydration. I love green tea anything. I thought this would be the best of both Green Tea and Milk Protein. I was wrong. It dried my hair and left it very frizzy. Are there real Green Tea and Milk Protein in the shampoo? Who really knows? I never even finished the whole bottle before giving it away. Overall, I just feel like it didn't change anything at all. I honestly think this shampoo made my hair, even more, frizzier and dried too. I'm sad to say that I will not be purchasing this shampoo again. Such a great and honest review. Thanks for sharing it.